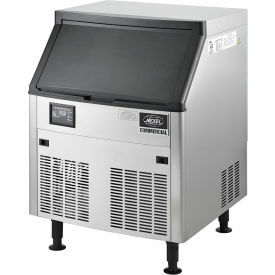 Self-Contained Ice Flakers With Built-In Storage Bin Are Used For Restaurants, Concession Stands, Buffets And More. 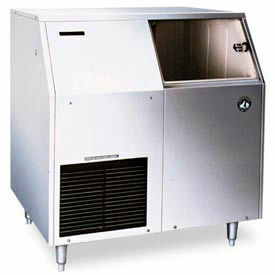 Self-contained ice flakers provide perfectly-sized flaked ice for seafood storage, beverage service and more. Stainless steel exterior ensures lasting durability and easy cleaning. Machines feature an automatic system flush when bin control is activated. Air coolers are removable. Available in a variety of styles to suit any needed volume of ice. NSF® certified. Self Contained Under Counter Cubers With Built-In Storage Bins Are Used For Applications Including Hospitality, Food Service, Commercial And More. Self contained under counter cubers with built-in storage bins are made of stainless steel for long lasting durability and corrosion resistance. Cuber design freezes water, eliminating minerals and impurities for improved quality and taste. Dual-sided evaporator is energy efficient, cost effective and environmentally friendly. Front ventilation system allows convenient unit servicing and maintenance. Units are not affected by caustic water eliminating ice plating or flaking. Condenser type is Air-Cooled. Styles are Self Contained Ice Machine, Self Contained Crescent Cuber w/ Built-In Storage Bin and Undercounter Ice Machine. 24 hour ice capacity ranges from 58 to 340 lbs. Color finish is Stainless Steel. NSF and ETL certified. Dimensions vary per model.